Finding a backpack designed to protect and carry all of your tech isn’t terribly hard these days. What sets the MOS Pack apart is that it can can also help keep all of your gear charged. Available in either black or gray, the MOS Pack features a cleaner look than most backpacks that are designed to carry all of your gadgets. The day you stop carrying a pen is the day you’ll actually need one. It’s not covered in mesh pouches, there’s no place to clip on a carabiner, and it’s branded with minimal logos. The pack has a classic design, which also means it doesn’t draw attention to itself, or make it obvious that you’re carrying around a bunch of expensive toys. While it holds plenty, the MOS Pack is hardly a large bag, so you can forget about trying to squeeze a weekend’s worth of clothing in there if you want to carry a laptop too. It’s not a carry-on replacement. On the back, you’ll find a zip-open pocket, which provides a place to quickly stash smaller items you might want to access more frequently, but aren’t particularly worried about keeping safe. The microfiber-lined pocket on top will keep sunglasses scratch-free, but easy accessible to wandering hands on a crowded train. Lots and lots of pockets and pouches for those who like to organize. A leakproof pocket inside the MOS Pack lets you carry a water bottle without the risk of soaking your electronics. Opening the MOS Pack’s main compartment reveals a collection of smaller pockets and pouches for storing more gadgets. There’s even a leakproof pocket, accessible only from the outside, designed to hold a water bottle. Not having a place to safely carry a water bottle and keep it from leaking onto everything inside was one of my biggest complaints with The North Face’s gadget-focused Access Pack. And the MOS Pack lets you carry a water bottle internally, so it doesn’t detract from bag’s clean aesthetics. The MOS Pack ‘s dedicated laptop compartment easily held my 15-inch MacBook Pro, and there’s room enough for slightly larger laptops, though, you might have trouble squeezing one of those monster portable gaming rigs inside. A 15-inch MacBook easily fit into the MOS Pack, but larger gaming-focused laptops might find it a tight squeeze. Gaming beasts aside, I had little trouble packing a small arsenal of tech (and the requisite charging cables and power adapters) into the MOS Pack. Given it’s a gadget-focused backpack, it’s not at all surprising you can stuff it full of, well, gadgets. What makes the MOS Pack unique is that it can also help keep all of those gadgets charged. The MOS Pack comes with the company’s MOS Reach, which is essentially a tiny power strip providing two USB ports and a grounded outlet. Throughout the MOS Pack you’ll also find access holes between the various pockets and compartments, as well as straps and loops allowing you to run and secure charging cables from your gadgets back to the MOS Reach. The MOS Reach is removable if you want to lighten the pack, and aren’t worried about keeping your gadgets charged. 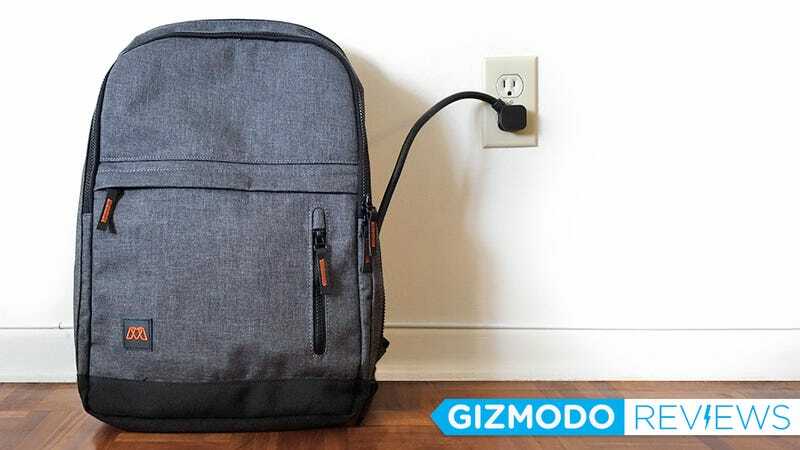 On the opposite side to the MOS Pack’s water bottle pocket you’ll find another zippered compartment housing the other end of the MOS Reach—a short extension cord ending in a grounded plug. When everything inside the pack is all wired up, the next time you’re in an airport and are lucky enough to find an available power outlet, you can plug the short extension cable into it, which will then power everything in your pack. Does it require a little extra effort when packing the MOS Pack to ensure your phone, tablet, and laptop are all connected up to the power cable? Yes. Does the extra cabling add weight to the pack? That’s also a compromise you’ll have to make, but at least the MOS Pack itself is nice and light before you start to fill it. But the advantage here is that you no longer have to juggle multiple chargers and cables when you manage to find an available power outlet. When the MOS Pack is plugged in, so are all your gadgets. No power outlets available? The MOS Pack can also hold an external battery pack for charging up your toys. When traveling, or even commuting, there are times when you just won’t have access to a power outlet. So inside the MOS Pack there’s also a dedicated pouch for holding an external battery pack. It won’t provide as much power as the MOS Reach can, but it’s better than nothing. The MOS Pack certainly isn’t the first backpack with pockets, pouches, and compartments specifically designed to safely store and organize your gadgets. Nor is it the first pack that can help keep everything charged—but it might be the first to perfectly balance that functionality with a design that doesn’t make you look like a walking electronics store. If you’re as obsessed with keeping all your gear charged as you are with keeping your bag organized, the $100 MOS Pack will make things a little easier for you. Particularly if you find yourself traveling and with limited access to power outlets. Knowing that everything in the bag is getting charged at once, instead of having to triage which gadget needs power the most, makes being on the road just a little easier. Plug in a single cable and charge all your gadgets at once. Provides an easy way to charge all of your gadgets at once whenever you have access to a power outlet. Clean, minimal design doesn’t broadcast to the world you’re carrying thousands of dollars worth of gadgets. Includes a leakproof bottle pocket that lets you carry a drink without worrying about soaking your expensive toys. Includes a MOS Reach power strip which can be removed to lighten your load, or used in a hotel room for extra outlets. Ideal for travel, but not large enough to pack a weekend’s worth of clothes in addition to your laptop and other electronics. For $100 you’re getting a lot of functionality in a backpack you’re actually going to want to carry.